I never got around to writing the obligatory New Year's Goals/Resolutions post. And I'm glad. If you are the type of person that makes a list of resolutions and actually follows through with them, well congratulations, but I am just NOT that person. To be perfectly honest, 2011 wasn't my best year. In fact it was right up at the top of the WORST list. I'm not much of a "personal details on the food blog" kind of girl, so I won't get into the dirty details, but life's been a struggle for me for the past handful of months. I was more than happy to swipe 2011 under the rug when that clock struck midnight! The one thing I have in mind for 2012 is to do everything in my power to make this year a million times better than 2011. The truth is, at my most darkest days, I am still one of the lucky ones. I have so many good things in my life and for that I am very grateful. Now back to the subject at hand. FOOD! Well considering the stress I've been under, my eating habits have kind of gone down the pooper... also considering that I live with someone that isn't afraid to eat dessert on a regular basis. I'm totally blaming him for my holiday weight gain! Not really but I did get a little out of control and my pants are a little bit tight. Ok, my jeans barely button, but my work pants still fit so we're good to go on that end. I've been trying to clean up my diet over the past couple of weeks and things are getting better. I've not gone completely Paleo again but I am trying to cut out the gf processed foods. I had some ground beef to use up so I decided to make meatballs and what goes with meatballs better than a soft squishy roll?? 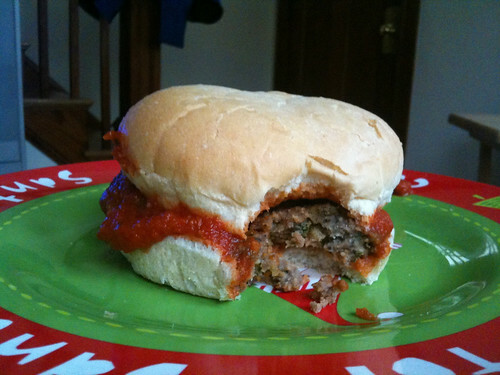 I bought some Rudi's Hamburger buns just for that and my lunch yesterday was SO delicious. Hit the spot. And yes, that is a Santa plate in January. We use that plate all year long. Adds a little joy to your lunch or dinner. The meatballs were made using Carol Fenster's recipe in 1,000 Gluten Free Recipes. I love that cookbook! Let me start off by saying that we really like what you have going on with A Life of Sugar and Spice, and that we believe Marshmallow Mischief would be an enriching addition to your site! Vegetarian, gluten-free, brown rice-lovin’ goodness! With Valentine’s Day just around the corner, We’d like to send you a sampling of our treats. If you like them, then we’d be deeply grateful if you could publish a review of our product on your website. If interested, please send us the address where you would like to receive these precious little darlings. Marshmallow Mischief looks forward to working with you in the future and cultivating a rewarding love-for-food friendship.